We would like to bless 80 families this Christmas season with the gift of 5 laying hens. This project is being coordinated with APDGUA which is a non-profit NGO in Guatemala that strives to help Guatemalan overcome poverty. These hens will provide families both a food source as well as income with any extra eggs that are produced. Families included in this project are from the towns of Santa Maria Ixhuatan, Barberena, Oratorio, La Laguna, Chiquimuililla and Las Fraijanes. Please consider donating to help fund this project this year. Go to www.gapkc.org and click on the paypal button to make a donation. Click on the Donate button to the right to donate to the project. 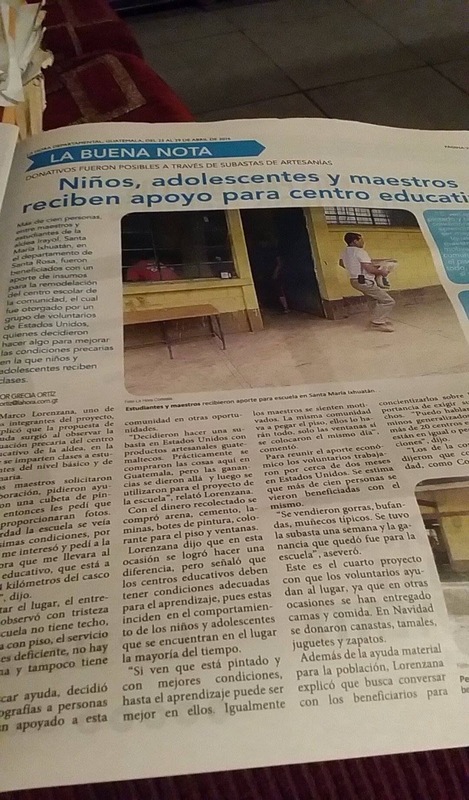 Article in Guatemalan Newspaper talking about our latest project! 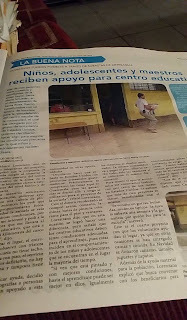 The following article was in the newspaper in Guatemala this week talking about the school project that GAPKC raised money to support. We raised $2000 which will give the school new windows, a roof and flooring and a fresh coat of paint. I will post a slideshow when the work is completed. The materials have all been delivered and the village is doing the work now. More than a hundred people, including teachers and students from the village Irayol , Santa María Ixhuatán , in the department of Santa Rosa , were benefited with a donation to be used for remodeling the school. The donation was granted by a group of US volunteers who decided to do something to improve the precarious conditions in which children and adolescents are taught . Marco Lorenzana , one of the members of the project, explained that the aid proposal arose when observing the precarious situation of the village school , where classes are taught to students of basico (middle school/high school) and elementary. "Teachers requested assistance if a bucket of paint could be provided to brighten the school. I then asked them to provide us with photos. The school really looked in terrible condition , so I was interested and asked the teacher to take me to school , which is about 14 kilometers from the town. When visiting the site, the interviewee noted with sadness that the school has no roof, has no floor, the bathrooms are in poor condition, there is a kitchen and has no doors. To seek help, he decided to send photos to people who have supported this community in other opportunities. "They decided to have an auction in America with Guatemalan handicrafts with things purchased here in Guatemala, all money was then used for the school project, "said Lorenzana. With the money collected sand, cement, metal, paint, floor tiles and windows was purchased. Lorenzana said that this time it made a difference but said that schools should have adequate conditions for learning, as these affect the behavior of children and adolescents who are in place most of the time. "If they see the school is painted and in better conditions they are more motivated to learn. Teachers feel equally motivated. The community is going to lay the floor, they will do everything, just the windows themselves were placed on the same day, "he said. To raise the economic contribution volunteers worked for about two months in the United States. It is estimated that over a hundred people were benefited with it. "Caps, scarves, typical dolls were sold. The auction was held for a week and the money that resulted sent to help the school, "he said. This is the fourth project that volunteers have help in this place, and at other times have been given beds and food. At Christmas baskets, tamales, toys and shoes were donated. In addition to material aid to the population, Lorenzana explained that he seeks to talk with beneficiaries to make them aware of the importance of demanding their rights. "I speak in generalized terms, that more than 20 schools are in the same or worse conditions," he said. "The community told me that as a community, as COCODE have made requests to the mayor and nobody had done to them. They thanked the management. The project's success is not to be done, but take care what you do and pledged to do to take care of what they received, "he said. GAPKC is honored to be hosting Alex and Leceta Chisholm Guibault from Our Guatemala: Travel with Purpose in Kansas City to share their story! Alex has an incredible story and tells it well. This will be a great opportunity for children and families to really look at another perspective outside the one that they are accustomed to living. They will learn what life is like in a third world country. Guests will learn about Guatemalan culture and life in Guatemala for the average person. Alex will share about his life and what he has overcome and how he is using his past to create a brighter future. Alex will speak about abandonment, neglect, homelessness and how he finally found his family as a young adult and is now embodying... the slogan of Be the Change. 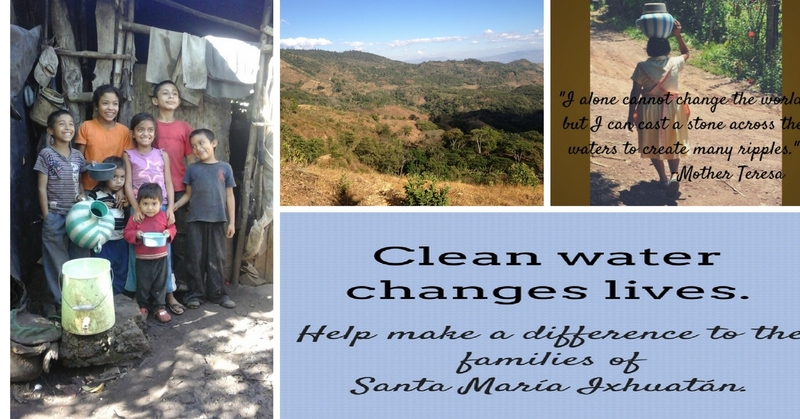 This will also be a kickoff event for the water project in Santa Maria Ixhuatan, Santa Rosa, Guatemala. Alex will share how he came to become involved in this community and the goals of the project. There will be light Guatemalan themed refreshments for a small donation as well as items for sale that were made in Guatemala. There will also be a raffle! 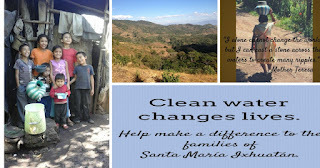 All proceeds and donations will go to support the Water Project in Santa Maria Ixhuatan, Guatemala. Purchase tickets by clicking the button on the right of this page to let us know how many guests to plan for. Cost is a donation of $10/adult, $5/child or $25/family. Please share this event with your friends! It will be a powerful evening that will change lives.